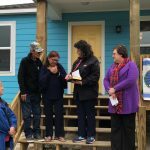 Fulton (KIII News) — A Fulton couple whose house and popular seafood restaurant were destroyed during Hurricane Harvey received the keys to their brand new home Wednesday morning. Nympha and Benny Arispe’s new home comes thanks to the efforts of some disaster recovery organizations. “I still can’t believe that it’s real, that there is a house,” Nympha said. After Harvey tore their Fulton home and business apart, the couple was forced to move to Cotulla, Texas, while they tried to figure out how to rebuild their life in Fulton. “A really bad disaster and our home was so damaged that it was too much to repair,” Nympha Arispe said. One day the Arispes received a phone call from the Coastal Bend Disaster Recovery Group. The Arispe’s couldn’t believe that volunteers from all over started building their new home by the end of June. “They had another group come, and another group and they just worked together so well,” Arispe said. Numerous churches, Samaritans Purse, and the Rockport-Fulton Chamber Foundation showed up to help with the home. “Looking in their eyes today makes it all worthwhile, and it really tells us what impact we are having on the community,” said Warren Phipps of the Coastal Bend Disaster Recovery Group. The house is only the second of many that they plan to build. The Arispes got their new home on the eve of their wedding anniversary. “Our home is the most beautiful present in the world,” Arispe said.